I saw it. You saw it. The whole world saw it. It was the moment when the refs decided an NFL conference championship game. It was a 3rd and 10 with a 1:45 left to go in the game. Drew Brees lined up in shotgun with Tre’Quan Smith to his right and with 2 receivers on each side of the O-line, both sets bunched up. Brees takes the snap and throws it quickly to the right side, where the aforementioned Smith was waiting. Then out of nowhere, he’s clobbered by Rams cornerback Nickell Robey-Coleman. 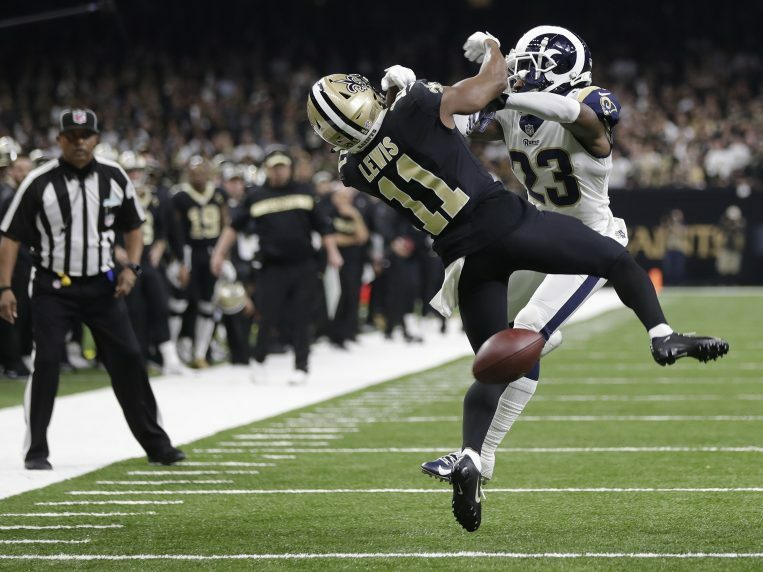 In what should be the most obvious pass interference at any level of football, somehow there was no flag, and the Rams got away with it. You know the rest, Wil Lutz kicks a field goal to give the Saints the lead, the Rams drive down the field and tie the game and then go on to win in overtime to punch their ticket to Atlanta. Afterwards, everyone including Saints fans, players, and head coach Sean Payton where justifiably livid at what just happened, and scrambled to try and find answers. But it was the fans who made the loudest noise, putting up billboards, calling for a rematch, and even going so far as to SUE THE NFL for “emotional trauma” or whatever lame excuse they had for them smashing their TVs and crying into their pillows. You could taste the salt from a mile away, they weren’t happy about it. “We were robbed,” they said as they smashed their keyboards, ranting on social media, “We should be in the Super Bowl!” Never mind the fact that the Saints had multiple calls go their way throughout the game, and that they got the ball first in OT and threw a pick, they were robbed, and something needed to be done. 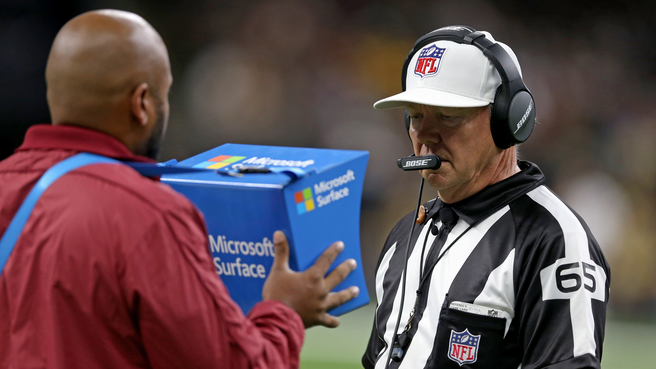 One thing that has come up in the aftermath of this whole debacle is giving the referees the ability to review potential pass interference penalties, it’s even going to be talked about during the owners meeting at the end of the season, and will be brought to the NFL’s Competition Committee. On paper it sounds like a good idea, if pass interference is reviewable, then you can always make the right call, and teams won’t be “robbed” anymore. If you’re a Saints fan you say “Awesome, that sounds great, if that play was reviewed, we would’ve won!” But there was no flag thrown, so there’s no pass interference to review. “Well, Sean Payton should’ve been able to challenge the non-call!” Well, the game was inside two minutes so the review would have to come from the booth. So then what happens, should the booth have to review every single play where there may or may not have been a pass interference penalty? I see a lot of things wrong with that. One of them being that I do not want to see the game being stopped MORE just because a receiver may have been lightly grazed on a slant route by a linebacker. Another thing is that sometimes referees set a tone of letting the players play. Now granted, that penalty should be called whether the refs set that tone or not, but I’m talking about in general. Corners should be able to play tight coverage on a receiver without fearing that the slightest grab may result in a pass interference penalty after a review. Imagine your team getting called for a pass interference penalty when the corner was just playing aggressively. You say “Hey, that guy didn’t commit a penalty, he’s just playing good, tight coverage on him, that shouldn’t warrant a pass interference call. Well, if refs are able to review it, these penalties would become common and there would be a lot of them. That means more penalties, which means longer games and no one wants to see that happen. Also, I and many others, want to see an actual football game. This league is already getting softer by the day with broad and vague roughing the passer and targeting rules. I don’t want to be bombarded with a 10 minute review after every passing play while the commentators ramble about what the call should be. The less I see Mike Pereira’s face, the better it is for me, and the more I enjoy the game. Also I would argue that you would open up Pandora’s Box if a rule like this was instituted. If pass interference, a judgement call, can be reviewed, then what’s next? Holding sometimes affects the outcome of a play or a game, should that be reviewable? When does it stop? If the referees threw a flag on every single infraction they spotted, football games would take 10 hours to finish. Referees need some bit of discretion on how they officiate games that they are in. Officiating isn’t like the stripes that the referees wear, it is often in a gray area. Every head football coach has their own philosophy and methods on how they coach their team, but they all play by the same rules, the same is true for football referees. While the rulebook sounds black and white and sounds like it should be officiated in a black and white way, during games, it often isn’t. Some referees do actually follow the rulebook verbatim; others choose to have a more lenient approach to their style of officiating. Those philosophies change from official to official, and they can change over the course of the season. There is no “right” philosophy, however there are many philosophies that are accepted and have been adopted by many officials. Let me give you a couple examples. Back in the 2015 playoffs, the Packers were playing the Cardinals in the NFC Divisional Round. In the 4th quarter, with Arizona down by 3 with 4 minutes to go, Carson Palmer and his team line up on 1st and Goal from the 8-yard line. He fires a pass across the middle and it’s tipped up in the air by Damarious Randall, into the end zone where it falls into the waiting arms of Michael Floyd for a touchdown. However another Arizona receiver, Jaron Brown, engaged Packers corner Casey Hayward before the ball was tipped and pushed him back into the secondary and to the goal line. By rule, this should be offensive pass interference, and the touchdown should not have counted. Yet that action didn’t free up Larry Fitzgerald, the intended receiver, or help Floyd get space in the end zone. It may have actually pushed Hayward in the direction of the deflected ball. It probably should have been a penalty, but the back judge decided that Brown’s actions didn’t help the Cardinals gain an advantage, and ultimately no flag was thrown. You know why? Because the referee had his own philosophy, his own judgement, and had his own discretion. He thought that if the action doesn’t gain the team an advantage, the flag should not be thrown. Is it wrong for him to think that? Absolutely not. Another example of this is actually something that happened this season. In Week 17, the Cowboys played the Giants. New York had the ball with just under a minute remaining, down by one. They had a 4th and 10 near midfield. Eli Manning takes the snap, steps up and throws over the middle to Cody Latimer. The cornerback, Anthony Brown, is playing tight coverage on him. As the pass is coming, Brown slightly wraps his left arm around Latimer’s waist, and uses his right hand to swat the pass down. Incomplete. Cowboys win. You could argue that there should’ve been a pass interference called on the play because of the slight wrap around, but the referee decides that there is a difference between draping a receiver completely while shielding the ball from ever reaching his hands, and just playing really tight coverage on someone. So he doesn’t throw the flag. If the NFL makes judgement calls, like pass interference and holding reviewable, you destroy all of that and it will do way more harm than good. Sure, teams might be able to get away with blatant penalties like the one seen in the NFC Championship Game, but when you start to review those types of penalties, you start to review more and more plays where the defender is slightly draped over a receiver, or where a slight tug is made on the back of the receiver’s jersey. It will get to a point where soon no corner or safety will even be able to touch a receiver. Now some people might think that sounds good, but trust me, it definitely won’t be. You can’t legislate human judgement out of sports officiating, no matter how hard you try. And even if you could, the sport and referees (everyone’s favorite scapegoat) would find a way to infuriate you; that’s what watching sports does to you. And even though you don’t want to admit it, that’s part of why we like watching sports. We love seeing those defensive backs play aggressive and shut receivers and the passing game down. We love seeing players playing a rough game with the opponent, we love seeing a physical game. The more rules and regulations you put in place, the more you boggle and water down the game to the point where it almost becomes unrecognizable. Referees already have a tough job on their hands, and they needs some sort of judgement and discretion when officiating a game of football. They surely don’t want the booth or a vague rulebook to mess with that. Referees are human, they will make mistakes, that doesn’t mean we should strip them of their ability to make their own judgements. If we did, it would just do more harm than good.